For someone planning a sports tournament, it’s easy to become frustrated and overwhelmed. You have to make sure the facilities are excellent, but also affordable. You have to ensure that every detail will be taken care of, and you also have to keep mom and dad happy. Oh, and if you could find some entertainment for the siblings, that would be great. There’s a lot of pressure on you to make it an event everyone will remember and want to attend next year. We get it. Planning a sports tournament is no easy feat and rarely does it ever feel seamless. Perhaps that is because you’ve never hosted a sports tournament in Seattle Southside. When you choose Seattle Southside professional stadiums, massive facilities, versatile sporting fields, ease of commute, big-city fun and natural wonders are all waiting for you. It’s a destination that has everything you need for planning a top-notch sporting event with high quality facilities, while also giving your teams plenty of entertainment options for their free time. Where do we even begin? Seattle Southside clearly is one of the best places in the Pacific Northwest to plan a sports tournament. A quick glance at the numbers: more than 25 soccer fields, more than 25 baseball and softball fields, eight aquatic venues, 2 performing arts centers and seven indoor basketball courts, not to mention golf courses, a BMX Park, disc golf courses, 3 bowling alleys and a hockey arena. One of the biggest and best facilities in the Seattle Southside area is the North SeaTac Park. Set on 160 acres of land, this public park offers excellent grounds for traditional sports like baseball (featuring three all-grass fields) and soccer. But it also has options for other sports, like a USA-certified dirt BMX track, an all-grass rugby field, 27 holes of disc golf, two RC tracks and an orienteering course. Other park amenities include a nature trail, picnic area and playground equipment. The park is open from sun-up to sundown 365 days of the year. You aren’t going to find a better venue for soccer in the Northwest, perhaps even the country, than Starfire Sports. 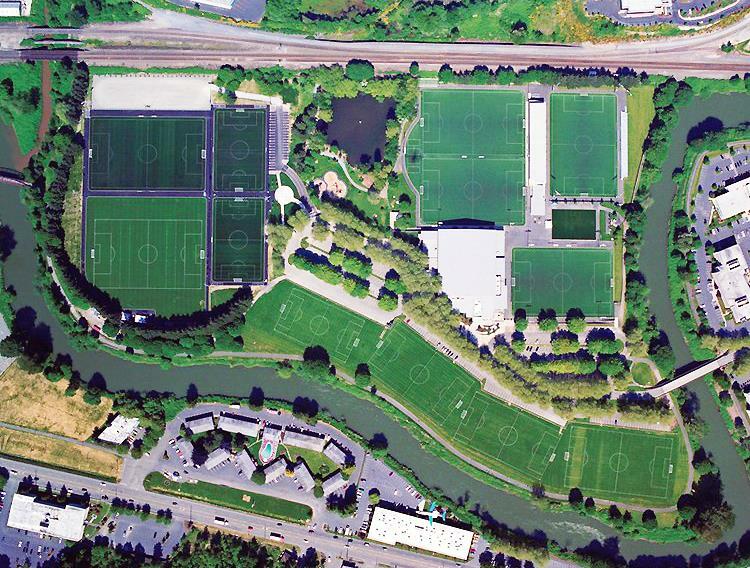 Home of the Seattle Sounders when they practice and train, this 54-acre facility can host up to 6,000 people. There are 14 fields total, 12 outdoor and two indoor, in addition to on-site concessions and vending. The 82,000-sq.-ft. Athletic Center features two indoor turf fields, three private rooms, locker rooms, restaurants, retail shops and a physical therapy & performance center. The main stadium, Starfire Stadium, can host over 4,000 people and has covered grandstands, a professional press box, PA system and digital scoreboard, and alcohol services available. While soccer is their specialty, Starfire Sports offers a variety of options to accommodate any kind of event you can envision–from lacrosse to CrossFit. Let their professional and knowledgeable staff will work with you to flawlessly execute your vision. Located between Seattle and Tacoma, Highline College offers up athletics with a view. Sitting just off the Puget Sound, Highline College’s campus and athletic fields are within viewing distance of the Olympic Mountain Range. The campus sits on 80 acres of land, and the Pavilion is a 22,917-sq.-ft. facility that seats up to 1,300 people. The indoor space can be used as two basketball courts or six volleyball courts. In addition to the pavilion, Highline College has a softball field, a soccer field, and an eight-lane, all-weather track. On the beach or in the park, the Des Moines Beach Park Event Center has the facilities to accommodate any group’s desire. Over 6,000 square feet of event space sit adjacent to the Des Moines Creek trail. This scenic, paved trail travels through old growth forests and connects three park systems – 70-acre Des Moines Creek Park, 22.5-acre Des Moines Beach Park Historic District and Tidelands, and 14-acre Des Moines Marina. This would be a great place to book a team lunch or recreational activity day. Your team can paddle board, scuba dive, fish or just relax in the great outdoors. Seattle Southside is uniquely positioned near the Seattle-Tacoma International Airport and the I-5 and I-405 corridors, making transportation in and out of the destination a breeze. It is just 15 minutes south of downtown Seattle and 20 minutes north of Tacoma. The airport offers 100+ non-stop flights domestically and from all over the world. Hotel rates are typically 20-30 percent less expensive than downtown Seattle and with more than 60 hotels and 100+ full-service restaurants, there are plenty of options to satisfy everyone’s needs. The sports sales team at Seattle Southside RTA will successfully and efficiently deliver complete event experiences for athletes, sponsors and stakeholders. They help source all-star venues and manage housing and rooms blocks. Need special group rates at local attractions? They can do that too and a whole lot more. RFP creation and site sourcing, itinerary planning, group rates at local attractions, housing and room block management, public relations and media services, welcome letters and registration bags. All of these services are complimentary to planners. What can we do when we’re not playing? Planning a sports tournament is more than just planning a sports tournament. Oftentimes, you’re orchestrating families’ vacations. While they want the team to play at the best facilities possible, if it comes at the expense of spending a weekend in the middle of nowhere with nothing to do, they’re not going to be excited about attending. Selecting a destination that provides lots of activities and attractions for families to enjoy before or after the tournament will make them more excited to attend. Seattle Southside combines world-class facilities, endless entertainment and some of the most beautiful natural landscapes on the continent. Take your team to Des Moines Marina and enjoy the benefits of the Beach Waterfront Park, which is nestled along Puget Sound. 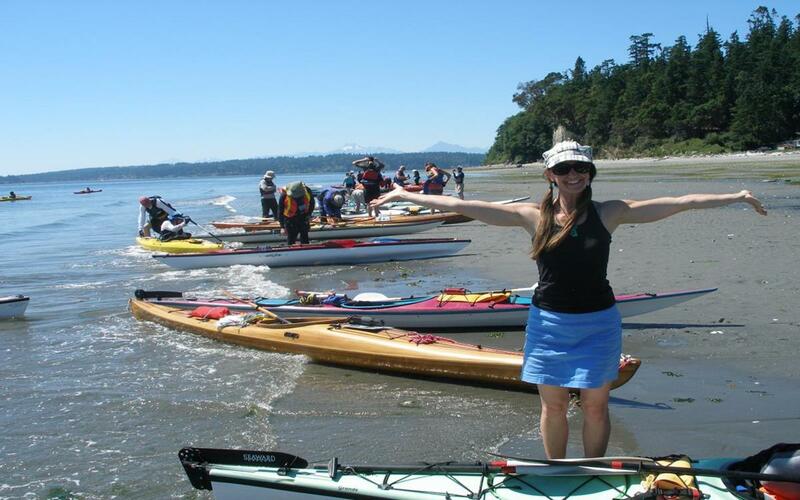 Treat your players and parents to stunning views of the Olympic Mountains while they paddleboard, scuba dive, beach comb or walk the nature trails. After they’ve had their fix of the outdoors, your group can check out the Museum of Flight, where they can see over 150 different kinds of aircraft, including the only space shuttle trainer from NASA. Other leisure options include several professional sports teams, getting a killer view from the world-famous Space Needle or strolling through the lively stalls of Pike Place Market. Seattle Southside, nestled between Seattle and Tacoma, is easy to reach. Scenic roads make the drive fly by, and a large international airport serves the region. By Car – Seattle is reachable in less than six hours from parts of Oregon, Idaho and Wyoming as well as British Columbia and Alberta. By Air – Seattle-Tacoma International Airport is located just south of Seattle, right in the heart of the Seattle Southside event spaces. Many of the sports facilities are less than a 15-minute drive from the airport, which is served by all major airlines. I can’t say enough about the facilities at Starfire Sports. It is the premier soccer complex in not only Washington but on the West Coast. 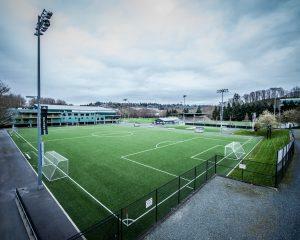 We host many events at Starfire including a 350+ team tournament and a 700+ Players College Camp each year. We always come back as our experience and relationship with the staff at Starfire is great. They are very easy to work with, professional, on top of their communication, and willing to assist in questions and needs throughout the planning process and the event itself. The ability to have locker rooms, covered areas to watch games, restaurants to eat and drink, a coffee shop, and a physical therapy office all in one location makes Starfire the top place to hold a sporting event.